South Korea’s entertainment company SM Entertainment Co. will launch an official online store this week for K-pop fans around the world to make overseas payment systems easier. Cafe24 Corp., Korea’s electronic commerce (e-commerce) platform provider, said on Tuesday that SM Entertainment will open its official online store, “SM Town & Store,” based on its solution, on Friday. The online store will provide service in four languages – Korean, English, Japanese, and Chinese – and receive overseas online payment platforms like PayPal and Alipay. The online store will be a global e-commerce platform that sells not only music albums, pictorials, and items of artists managed by SM Entertainment but also various lifestyle products related to celebrities such as in the field of beauty and fashion, Cafe24 said. The online store will also offer a mobile application service from April 12. According to Cafe24, SM Town & Store will offer a personalized service to visitors, called Celeb for You, where fans will be given notice of latest items of celebrities chosen by them upon subscribing. 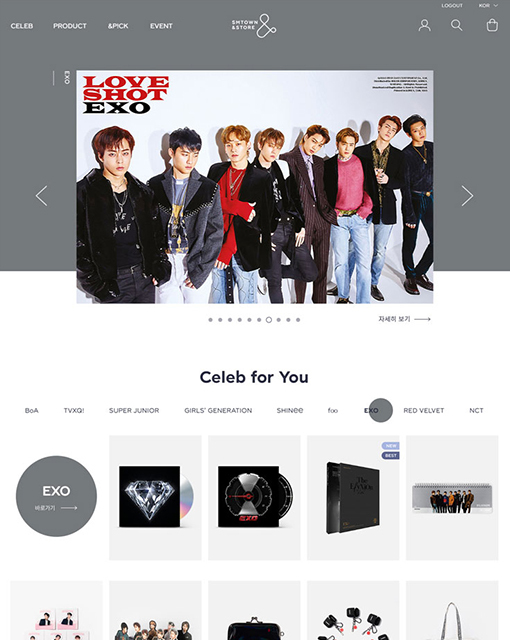 The store will also have a section called Celeb Pick where items recommended by SM Entertainment artists will be listed, and also Media Pick that categorizes popular items. Stylist P!ck section will offer fans trendy recommendations by stylists that look after celebrities. SM Town & Store will also allow fans to order customized products and items as well as limited editions. SM Town & Store, meanwhile, is offering an online event ahead of the official opening through its pre-page for newly subscribing members. There will also be a guerilla promotion event from April 12 where celebrities personally deliver parcels to their fans.